Up to 2600mm sweeping width. Heat insulated, tinted, safety glass. Safely climbs up curbs and gutters. 2 x 900 mm diameter brushes. Power assisted front wheel steering with 4 wheel steering when sweeping. Full registration light kit (registration at cost). 78 dB(A) noise level at operator ear. 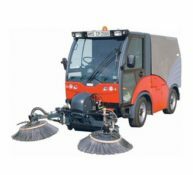 The Hako Citymaster 2000 with 2 brush system is a heavy-duty sweeper with its maximum sweeping width of 2.50m and the automatic four wheel steering switched on in working mode, which ensures cleanliness not only on large areas but also in narrow restricted areas and 90º corners all year round. As a result of the separate brush control the Hako Citymaster 2000 2 B is particularly suitable for narrow areas, in which a separate swivelling of the brushes and the highest possible flexibility is required. With the standard four wheel steering, which remains in its tracks, the Hako Citymaster 2000 can be manoeuvred in every corner or narrow alley way. 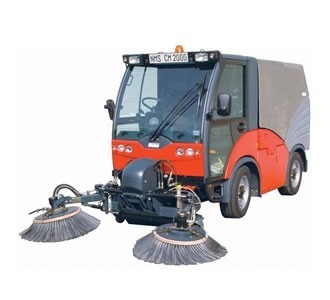 The Citymaster 2000 with 3 brush system – as a heavy-duty sweeper – is convincing as a result of its multi-functionality in summer as well as in winter. With a maximum working width of 2.60 m and the automatic four wheel steering switched on in working mode, the Citymaster 2000 with 3 brush system is ideal for working on wide paths as well as for sweeping on two levels, around traffic islands and e.g. in gutters.